We incorporate many of the A Beka teaching materials which includes a very strong phonics based system for beginning readers. Knowledge of letters and sounds prior to this class is very helpful, as it moves at a fast pace. There is Kindergarten entrance test that will be taken by the student prior to enrollment. We will continue to highlight developmental skills and activities in the classroom, and keep creative art work coming home, along with the challenging curriculum. A balanced approach helps prepare all children for future years of education, no matter where they attend school. Class sizes are between 12 and 14 students. Children will also attend music and physical education classes, have recess and a lunch period. There will be an opportunity to enrich their experience by selecting some after school special activities/classes that will be held once a week for a semester. We generally offer taekwondo, gymnastics, Spanish, art, Engineering, Discover & Explore Science, a cooking class, Lego club and Running Club. We also have a Daisy Girl Scout troop. This colorful book reinforces number concepts and formation of numbers up through 100. It also covers simple addition and subtraction combinations, telling time, number sequences, number words, basic fractions and working with money. In addition to this math workbook, our students will become proficient in using 10 frames, boogie boards, ipads to solve math problems. Many hands on manipulatives help children gain profiency in basic number sense, and advanced concepts. STEM is intergrated by the teachers through cooperative learning experiences, and free play with STEM manipulatives and games. This book begins with reviewing vowels and consonant sounds, blends, one and two vowel words, words with special sounds and sentence comprehension. This is a 48-page book of blends and words for practice at home and school. This set of 12 books are actually read along with phonics instruction and prepare the Kindergarten students for more difficult books in the curriculum. Kindergarteners learn about God's plan for seeds, animals, the seashore, health, weather and seasons with the help of this big, colorful science workbook. Students raise butterflies, visit a veternarian, grow root vegetables, use many scientific tools, conduct experiments and incorporate literature, math and creative writing with their science units. Students learn about community helpers, America, our great country, Virginia, and 11 different countries in this semester long study. We study China, Japan, Mexico, Peru, Netherlands, Australia, Germany, Israel, Kenya, Italy, and Canada. We learn basic map skills, what makes a community, a city/town. We conclude our Social Studies with an International Luncheon featuring all the countries in the unit of study during the semester. Students will be tracing and practicing letter formation, in manuscript (print) while reviewing phonics. Students will use lines and "letter houses" to help with correct placement. Children also practice correct formation and number recognition as they write numbers 1-100. They write numbers by "families" (20-29) as well as by fives, tens, and twos. Students will spend time in the creative writing process with weekly journaling, story writing and illustrating, one book report, a family book and a favorite things book at the end of the year. We use the Association of Christian Schools Purposeful Design Bible Curriculum. This engaging, colorful and culture-rich program introduces many great Bible stories with a practical application for today's K students. Bible verses are learned with each weekly lesson. Other larger portions of scripture are learned throughout the year to include 'the Books of the Bible', 'the 23rd Psalm', 'the 10 Commandments', 'the Lord's Prayer', John 3:16, and 'the Fruits of the Spirit'. Students pray together each day, and work on Character Development that reflects Christian conduct in our day. 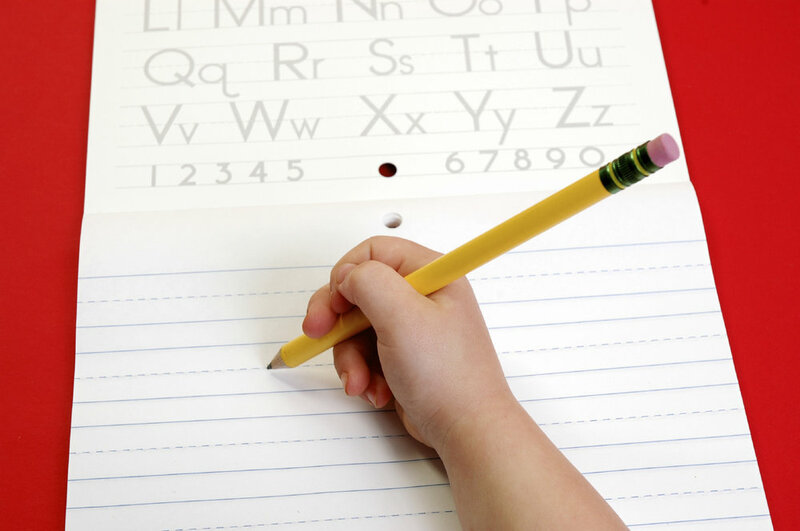 "Wee Write" is a creative writing program for Kindergarten students, incorporating the 6 +1 Traits of Writing. The children will use familiar literature to develop vocabulary, critical thinking, decoding of words, punctuation, and creative story telling and illustrating. Journaling is a big part of our school year, and it is a delight to see students move from illustrating with just a word, to a phrase, to sentences and finallly a paragraph! Students are introduced to iPads during the year, with learning centers and group activities. We have 6 laptops and 12 iPads for student use under guided instruction by the teaching staff. Students will use the ipad for test taking with Accelerated Reader, for listening activities, and problem solving applications. Children are assessed during each quarter for report cards. We also administer the Star Early Literacy Computer Based Testing during the school year, we may use either the Terra Nova Test or Iowa Basic Skills Test in April, and we will evaluate children with the DRA assessment and reading book level several times during the school year. We have added Accelerated Reader to our assessments in 2016. Kindergarten students will also be given the PALS assessment in both fall and spring. These test scores and report card details will help your child's future school get a clear picture of your child's skills, reading level, and abilities. All testing scores will be sent to follow on schools as requested.